Itchmo: News For Dogs & Cats » Blog Archive » Hello Up There? Can You Get Off Of Me? Hello Up There? Can You Get Off Of Me? 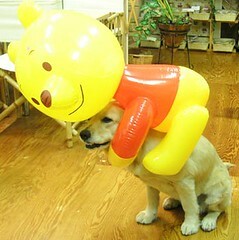 Hey, Winnie-the-Pooh, you need to lay off the honey — you’re kind of heavy. This entry was posted on Saturday, May 12th, 2007 at 3:55 am	and is filed under Dogs, National Dog, Cat & Pet Info, Art & Pictures of Cats & Dogs. You can follow any responses to this entry through the RSS 2.0 feed. Both comments and pings are currently closed. Buster, an 8-month-old Golden Retriever models “The Pooh,” a new product being marketed as a comfortable alternative to the dreaded “Elizabethan collar.” This inflatable restraint also comes in “The Eyeore” for large dogs, “The Piglet” for small dogs and young puppies, and “The Tigger” for especially bouncy, trouncy, fun, fun, fun, pets on the mend. Stupid people, do they really think this is cute?